George Toman sent along a new idea to improve an Optivisor for use at the workbench. Here’s George with his tips. I find as I age I need more light for fine detail work and want that light where I am working. 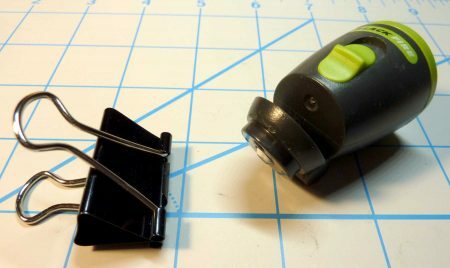 I have looked at investing in an LED or other light made for the Optivisor and ran across this little LED Worklight made by Blackfire at Home Depot for $6.95. 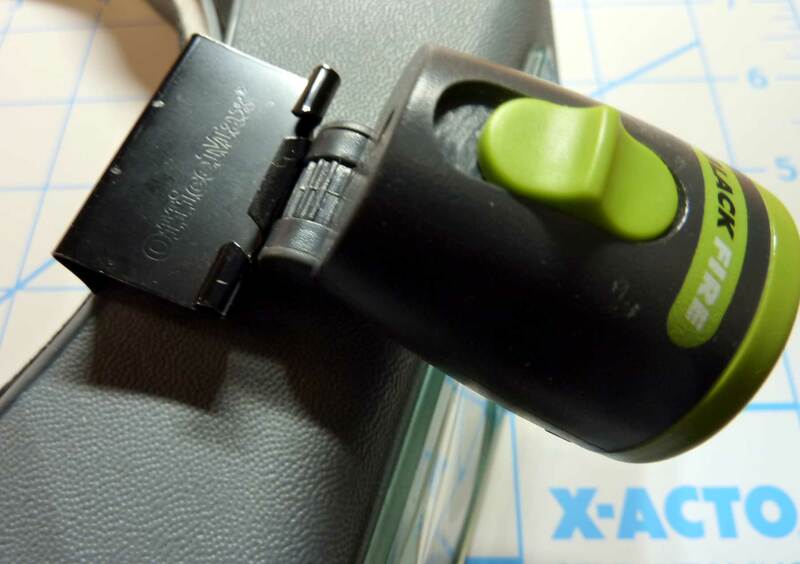 Model # BBM890XG Mini Clamp Light. It is also available on Amazon. I wanted something that I could direct the light, be light weight and removable. As seen in the photo above this little light did just that. 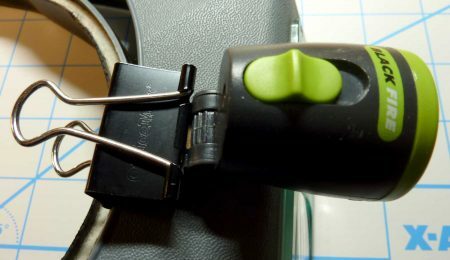 I modified the light and attached with an Office Binder Clip. That’s it! Done! Here is a photo of the Mini Clip Light as I purchased. The swivel clip is easily removed by prying it off with a thin blade screw driver. 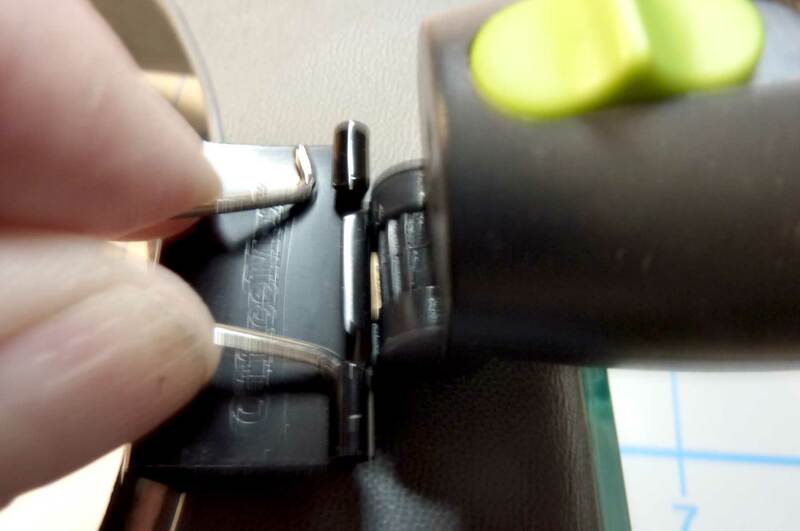 I removed the clip that came with the light as it did not fit the front of the Optivisor very well and felt top heavy. Here is a sequence of steps to attach the clamp light with a common office binder clip. 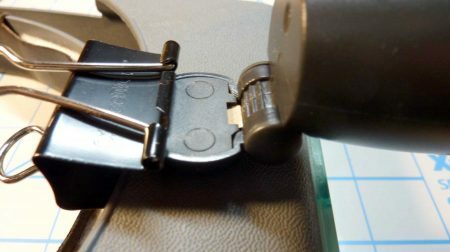 A medium binder clip was used. It measures 1.25-inches wide and about 5/8-inches thick. Squeeze the binder clip handles and attach to the top of the Optivisor. The lamp sticks out just far enough that you can direct it up or down. Notice indents in the lamp bracket that allows you adjust the light angle. Squeeze the silver handles to remove them. You can save these for later removal if you wish as handles make it easier to remove and reinstall clamp light. Now it is ready for use! 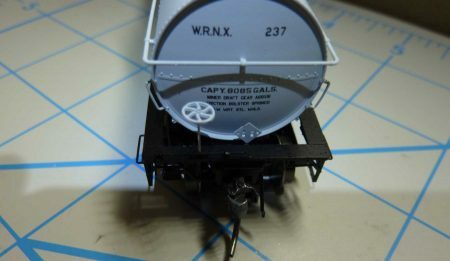 Here’s an HO scale Tangent Warren tank car on the workbench. The photo was taken using low light. 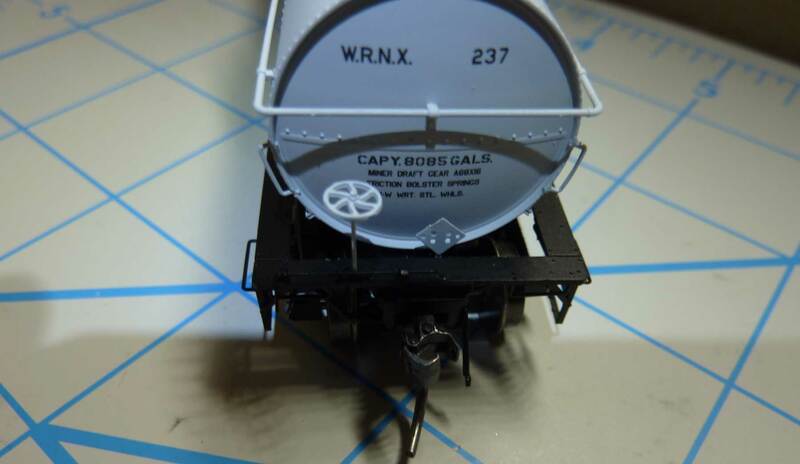 And here’s how the tank car looks with the modified Optivisor with the Blackfire mini clamp light on. The image was taken in same low light as the previous image. As LED’s develop, I am sure there will be other similar and improved lights that I will be trying in the future, but for now I find this to be a very handy tool. I’ve got a feeling many of us will be modifying this LED to attach to our Optivisors soon. We thank George Toman for sharing this handy tip. If you are ready to buy a new magnifier with a light, enter “headband magnifier with light” or “head mounted magnifier with light” in your searches to find more products. A wide variety is available at different price points. Good idea for upgrading my Optivisor. 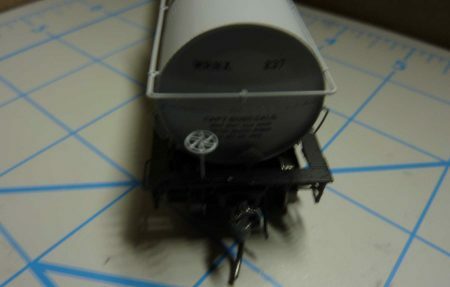 No such thing as too much light for working on a kit with LED lighting getting better.